Did you know the dachshund was the first dog from the United Kingdom to get cloned? Indeed! We tried it out, but it didn’t quite go as planned. Apparently our science was a lot more literal than we expected. At first, we were like, “yikes, what's up with this,” but then we gave him some pats and cuddles, and, well, here we are. 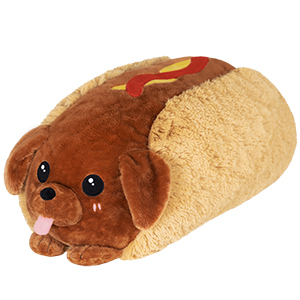 Delectably endearing, this hot dog is just for snuggles and not food! 15 squishy inches of perfect oddball! All new polyester fiber, ages 3 and up!